I have been using Vim now for many years, but usually with fairly vanilla setup as I did not want to depend on fancy features if had to work remotely on older machines. Those days are now gone and I can focus my hacking on somewhat recent Linux installations and using the latest Vim versions. The screenshot shows the output of the vim-plug command :PlugUpdate and the 24 bit color scheme tender. On a day-to-day basis I am editing Python 98% of my time, with some bash and LaTeX in the last 2%, so the plugins I have listed below are biased towards python. 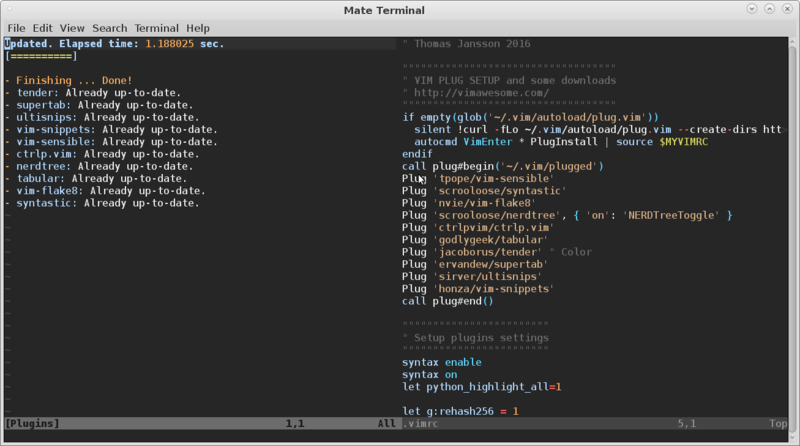 A major development in my Vim usage was the vim-plug plugin manager and the corresponding plugins. My full .vimrc is listed below, but can also be found on my github page: github.com/tjansson60/dotfiles. The most important change is the the plugin manager which needs a little more explanation. This short snippet below is pure magic. On a complete blank Linux shell without a .vimrc or .vim folder this will download the vim-plug plugin manager and afterwards install all my plugins. All I have to do to set up my Vim environment is to download my .vimrc below and start vim. That’s it. On the site github.com/junegunn/vim-plug the usage of the plugin manager vim-plug is describe. This most important command is in my opinion :PlugUpdate which updates all the plugins (git pull). The screenshot above illustrates the output of the PlugUpdate command. The most popular Vim scripts and plugins and associated vim-plug line are listed on vimawesome.com. Below are short descriptions of the plugins I am currently using. Think of sensible.vim as one step above ‘nocompatible’ mode: a universal set of defaults that (hopefully) everyone can agree on. Syntastic is a syntax checking plugin for Vim that runs files through external syntax checkers and displays any resulting errors to the user. This can be done on demand, or automatically as files are saved. vim-flake8 is a Vim plugin that runs the currently open file through Flake8, a static syntax and style checker for Python source code. The NERD tree allows you to explore your filesystem and to open files and directories. It presents the filesystem to you in the form of a tree which you manipulate with the keyboard and/or mouse. Full path fuzzy file, buffer, mru, tag, … finder for Vim. Sometimes, it’s useful to line up text. Naturally, it’s nicer to have the computer do this for you, since aligning things by hand quickly becomes unpleasant. UltiSnips is the ultimate solution for snippets in Vim. It has tons of features and is very fast. This repository contains snippets files for various programming languages. It is community-maintained and many people have contributed snippet files and other improvements already. set textwidth=120 " Not quite PEP8, but more readable on modern machines. It is great Thomas, thanks for sharing! I had some trouble with the UltiSnips plugin. It turns out that Ubuntu does not install vim with python bindings per default!